The Panther Front Bumper by American Built Truck Equipment comes with a textured flat black powder coat finish. 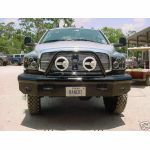 The front bumper comes with holes for lights mounted in the bumper, shackle mounts, & 4 holes drilled to run off road aftermarket lights. They will handle up to a 12K winch, but not all 12K winches. 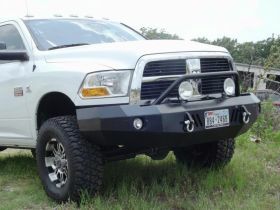 E-mail me to check to make sure your specific winch will work before purchasing. The winch, 4 off road lights, lights mounted in the bumper, & tow shackles are not included. These parts ship directly from the Mfg. Even if you are a local buyer you will have to pay shipping on this part.